The second in command at the Los Angeles Sheriff’s Department (LASD) and a captain in charge of internal criminal investigations at the LASD were indicted Wednesday on obstruction of justice charges for allegedly directing efforts to quash a federal investigation into corruption and civil rights violations by sheriff’s deputies at two downtown jail complexes. A federal grand jury yesterday returned a five-count indictment against former Undersheriff Paul Tanaka and Capt. William Carey, both 56. Both men allegedly participated in a broad conspiracy to obstruct the investigation, a scheme that started when the sheriff’s department learned that an inmate at the Men’s Central Jail (MCJ) was an FBI informant. Tanaka and Carey allegedly directed, oversaw and participated in a conspiracy that last year resulted in the conviction of seven other former LASD deputies. 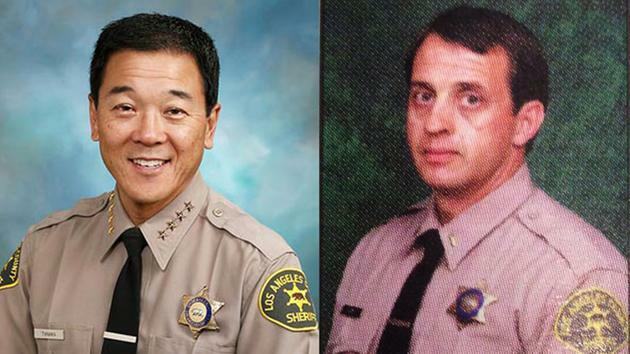 Former Undersheriff Paul Tanaka and Capt. William Carey. The scheme to thwart the federal investigation allegedly started when deputies in August 2011 recovered a mobile phone from an inmate at the jail, linked the phone to the FBI, and determined that the inmate was an informant for the FBI and was cooperating in a federal corruption civil rights investigation. The phone was given to the inmate by a corrupt deputy, who subsequently pleaded guilty to federal bribery charges. Alarmed by the federal investigation, members of the conspiracy, guided by Tanaka and Carey, took affirmative steps to hide the cooperator from the FBI and the United States Marshals Service, which was attempting to bring the inmate to testify before a federal grand jury in response to an order issued by a federal judge. The indictment alleges that as part of the conspiracy, the deputies altered records to make it appear that the cooperator had been released. They then re-booked the inmate under a different name, moved him to secure locations, prohibited FBI access to the informant, and then told the cooperator that he had been abandoned by the FBI. Over the course of several weeks, members of the conspiracy allegedly sought an order from a Los Angeles Superior Court judge that would have compelled the FBI to turn over information about its investigation to the LASD. After the judge refused to issue the order because he had no jurisdiction over the federal law enforcement agency, and even though it was clear that the FBI was properly acting in the course of a lawful investigation, Tanaka and Carey met to discuss having two sergeants approach the lead FBI case agent. Soon thereafter, the sergeants confronted the agent at her residence in an attempt to intimidate her. The sergeants threatened the agent with arrest and later reiterated this threat to her supervisor, stating that the agent’s arrest was imminent. The conspiracy count carries a statutory maximum sentence of five years in federal prison, and the obstruction of justice charges carry a maximum penalty of 10 years. The two false declaration counts against Carey each carry a potential penalty of five years. As a result of this investigation, a total of 21 defendants who held various ranks in the LASD have been charged, including the deputy who took the bribe to smuggle the phone and seven co-conspirators in the scheme to obstruct justice. The investigation into corruption, civil rights abuses and obstruction of justice related to the Los Angeles County jails is being conducted by the Federal Bureau of Investigation. Oh if only the FBI would investigate the SLO county jail. We may not be as big as LA but the corruption is just as deep. Desperate men go to desperate measures. Their actions are inexcusable, they deserve to be punished to the fullest extent of the law. that’s probley not too far off, unless the informant was already responsible for a cop being convicted. then they would just arrest him, throw him in general pop. or a special six man cell and go on a lunch break. no questions asked. there are a few good leos out there who actually care about people and have integrity, but with what has gone on in this county let alone country, appears to be gangs with badges if you ask me. to actually intimidate an fbi case agent at her house?! you can root/vote out corrupt leos and politicians, best case scenario, youd have a few leos left. b) the officers would claim stress and file for disability…then. c) the officers would be granted disability…then. d) the officers would file for retirement…. they would come out of retirement and be rehired on a temporary basis at double their previous salary while collecting then other money. Root out the corrupt LEO’s, vote out the corrupt politicians.